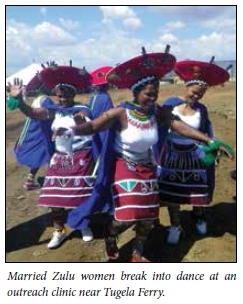 For 3 stormy years from the time Tugela Ferry's doctors first uncovered what turned out to be an alarming countrywide extensively drug-resistant tuberculosis (XDR-TB) prevalence (2005 - 2007), they diagnosed 110 new XDR-TB cases per year. Yet by implementing a combination of interventions with a remarkable team, the tap was turned down to less than 10 cases in 2012, making the Church of Scotland Hospital (CoSH) an international beacon of best practice. Izindaba returned there after 6 years to find out how they are helping to quell the general TB epidemic itself. Just a few months short of 60 years old, Thengokwakhe Nkala, a former migrant worker from rural KwaZulu-Natal (KZN), has been to hell and back. 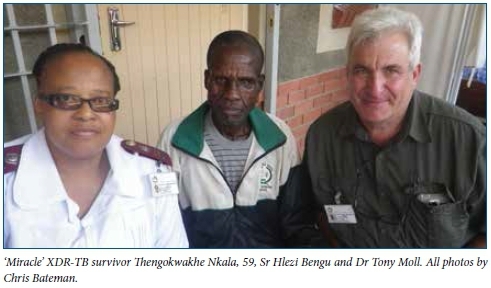 His sunken eyes and a humble demeanour are as much clues to his massively against-the-odds survival of XDR-TB as they are a reflection of the harshly hot, rocky thornveld in which he, his wife and eight children eke out a living near Tugela Ferry. All he knows of the 85% XDR-TB death rate among hundreds of fellow patients at Tugela Ferry's CoSH between 2005 and now is that 'a lot' of people like him who were transferred to King George V Hospital (Durban) suffering from multidrug-resistant (MDR)- or XDR-TB died. 'Aba-sekho' (they are no longer with us), he shrugs with a millennia-old acceptance of Africa's cruel mysteries. His coughing began while he was working at a cement factory in Johannesburg and rapidly became so bad that he returned home 'when I felt my strength had gone' in 2008. He reported to CoSH within months, a fortuitous 3 years after tenacious medical detective work by its doctors had helped identify 'XDR'-TB as responsible for the deaths of 52 of the 53 local inpatients whose sputum culture tests resisted every drug thrown at them (by Durban's Nkosi Albert Luthuli Hospital laboratory technicians) in 2005. Nkala's quick transfer to the TB-specialising King George V Hospital was a last-gasp hope, driven by the slim chance that a correct diagnosis and appropriate combination of drugs, plus sheer good luck, might work. He spent 18 months in an isolation ward, enduring 160 injections of kanamycin over 6 months, along with an oral TB and HIV drug regimen, often writhing in pain and discomfort from the debilitating side-effects as he dimly watched members of his clan and tribe daily breathe their last alongside him. By October 2006, CoSH had diagnosed over 200 XDR-TB cases, the highest number at any single hospital on the planet, and with emerging figures from across the globe, the WHO called a summit in Geneva where Moll presented the team's findings, and the current definition of XDR-TB was coined. 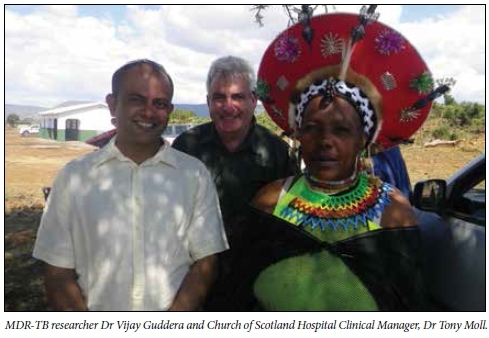 The remote 83-year-old, 350-bed KZN district hospital, founded by Scottish doctor-missionary, George William Gale on what was the Zululand side of the Tugela River (then linked to Natal by a rope-spanned ferry), has a history of selfless, dedicated service by Christian doctors to the estimated 200 000 traditional Zulus of Msinga, the poorest subdistrict in the country. The latest embodiments of this altruistic culture are Drs Tony Moll and Francois Eksteen, veterans of 28 years and 18 years respectively at CoSH. Moll currently heads the local antiretroviral (ARV) programme and with his wife Debbie, a local school principal, has raised four children here. Eksteen manages clinical care for the hospital's nearly 80 TB inpatients and consults weekly at the specialised MDR-TB clinic in Greytown. Both went for ARV drug training under Prof. Gerald Friedland (Epidemiology and Public Health) at Yale University as early as 2003. That decision enabled CoSH to quietly provide ARVs to 100 patients, the drugs coming from Yale. The first sign that the AIDS-denying late Health Minister Dr Manto Tshabalala-Msimang would yield to international pressure came a year later -via an official international-media-attended ARV 'launch' at CoSH, the first public hospital to provide ARVs on the national rollout (just one month before the April 2004 national elections). Patients flooded in, mostly with CD4 counts dangerously below 100 cells/μL (today the ARV inception threshold is 500/ μL) and among them a small but significant percentage carrying undiagnosed MDR-and XDR-TB, creating the 'perfect storm' for nosocomial spread. As the TB-drug-resistant contagion multiplied, the doctors were carefully monitoring all ARV treatment side-effects, CD4 cell counts and viral loads, witnessing mostly astounding improvements (after 13 years of AIDS palliative care). Many AIDS patients were too far advanced, but if they managed 3 months on ARVs before succumbing to opportunistic infections, the disease usually turned around and they survived. Moll and Eksteen noticed two patients (initially) whose CD4 cell counts stubbornly (and unusually) refused to budge, their viral loads remaining suppressed. Their opportunistic infections were being treated -but signs and symptoms of TB continued, 'so we immediately thought of MDR-TB', says Moll. Two university student interns needed a project, 'so I said set up a table and do a specimen snapshot of every single coughing in- and outpatient'. Some 45 samples were sent off to the Durban lab, and in May 2005 Moll received an alarmed call from chief pathologist Dr Lynne Roux, saying that six of the samples resisted every drug thrown at them - and that four other samples from Greytown and Durban had behaved identically. Their two MDR suspects were in the group. Provincial and national case finding began in earnest. By 2007 some 60 KZN health facilities were identified as having patients with XDR- and MDR-TB, a survey of 19 of them a year later showing an average of 15% MDR-TB and 3% XDR-TB among confirmed TB patients. National data from across all nine provinces in 2007 revealed 1 000 XDR-TB cases and 7 350 MDR-TB cases, almost certainly the tip of an iceberg. By October 2006, CoSH had diagnosed over 200 XDR-TB cases, the highest number at any single hospital on the planet, and with emerging figures from across the globe, the World Health Organization (WHO) called a summit in Geneva where Moll presented the team's findings, and the current definition of XDR-TB was coined. With international interest focused on Tugela Ferry, attracting operational research funding, a strong collaboration was being formed at CoSH including partners from Yale (Profs Friedland, Gandhi, Shah and Shenoi), the University of KZN (Prof. Sturm), an Italian corporation (Dr Marra), the provincial TB office (Dr Margot), the local district manager (Mr Mndebele), and many others who joined later. 'Without technical assistance from this amazing team and support from the DOH, we would not have been able to crunch this rock or roll it away as we have done,' says Moll. 'With a virtually untreatable airborne infection in our midst, this put us healthcare workers into another league of danger and vulnerability.' The team immediately upped surveillance, resulting in the now famously documented 53 positive cultures, half of whose owners had died by the time the results came back 6 weeks after sputum collection. Even scarier, 26 of them had never had TB before, indicating first-time presentation with XDR-TB. By 2009, when CoSH's XDR numbers had grown to 500 (98% of them HIV-positive), 'we (seemingly paradoxically) relaxed a bit; it showed us that it wasn't so transmissible after all'. The transmission was in fact mostly nosocomial, requiring drastic infection control measures, including isolation and fast-tracking of coughing patients. Every worker in the hospital high-risk areas wears an N95 mask and outpatients sit in decongested, airy, sheltered outdoor waiting areas. Infection control officers and nurses monitor constantly, ensuring that all windows remain open. This gave birth to the province's first MDR-TB 'decentralised' hospital, also the first in the country, which is now in full swing in nearby Greytown, a 45-minute mountainous drive away. It is here that I once again meet Moll, 6 years after spending two nights at his CoSH home while confronting the full reality of what was portrayed in the lay media as an XDR-TB 'outbreak' (what the CoSH team found merely epitomised the unseen national contagion that is today an even greater threat than HIV, the precursor MDR-TB pandemic having doubled in size and XDR-TB prevalence slowly burgeoning). Greytown is a small farming village nestled among dairy, beef and crop farms and sprawling timber plantations in misty, green, rolling countryside, dramatically different to the harsh Tugela valley below. It now hosts the hospital lifeline for MDR-TB and pre-XDR-TB patients. Simply called M3, it was rededicated as an exclusive 37-bed MDR-TB hospital in 2007, rolling out treatment in February the following year. Subsequently several similar MDR-TB hospitals have opened in South Africa, reducing the major current bed shortages but 'de-institutionalising' MDR/XDR-TB management. (According to national MDR-TB chief Dr Norbert Ndjeka, nearly half of all diagnosed cases are not started on treatment and patients wait up to 2 months for admission.) As much as political AIDS denialism delayed ARVs, unnecessarily costing countless lives, the triumph of quick intervention when a deadly disease is detected is epitomised by Greytown's M3 MDR-TB hospital. Fast diagnosis and swift initiation of effective treatment is essential, as patients respond better with early treatment and soon stop transmitting disease. 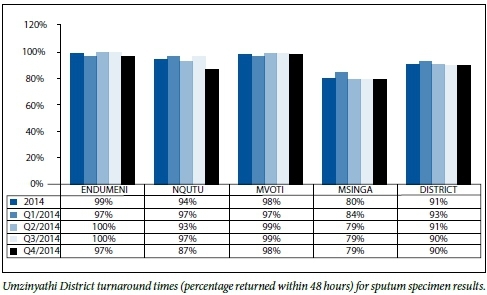 A full 85% of patients are smear-negative after 2 months of treatment. GeneXpert testing for rifampicin resistance has doubled MDR-TB diagnostic accuracy and hugely reduced the time to treatment initiation (from 2 months to just 48 hours). 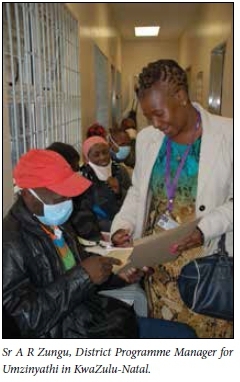 Ninety per cent of all sputum specimens sent from all facilities in the Umzinyathi District (which Greytown M3 covers as an MDR-TB referral facility) were returned within 48 hours last year, allowing treatment of smear-positive patients to begin immediately. After a short admission to M3, patients are discharged to the novel Community Management of MDR-TB Programme and cared for in their own homes by outreach teams arriving in rugged-terrain vehicles and doing daily home-based administration of the injections, screening and educating family members, and monitoring for any side-effects. Initially there were 13 outreach teams - now only four are needed. The huge success of this programme has its essence in the caring community support wrapped around each patient going through those tough, long 18 - 24 months of treatment, resulting in improved patient satisfaction and excellent outcomes. The programme has become a national DR/XDR-TB benchmark model. The University Research Council came on board and bankrolled a 2-year mentoring programme for satellite and decentralised sites in eight other provinces, with most provinces (and several international institutions) sending their top TB and HIV managers and clinicians to learn the ropes at CoSH and Greytown. 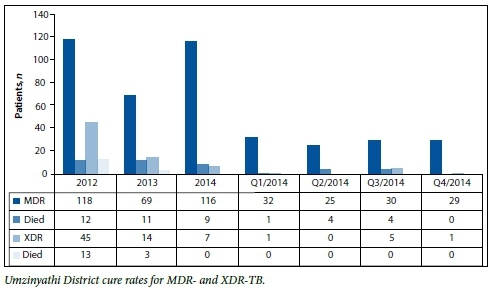 Yet they're obviously doing something right; initially nearly half of all Greytown's MDR-TB patients were pre-XDR, now it's down to about 15%. The average inpatient stay is 4 - 6 weeks, compared with 4 months when the facility opened 7 years ago. 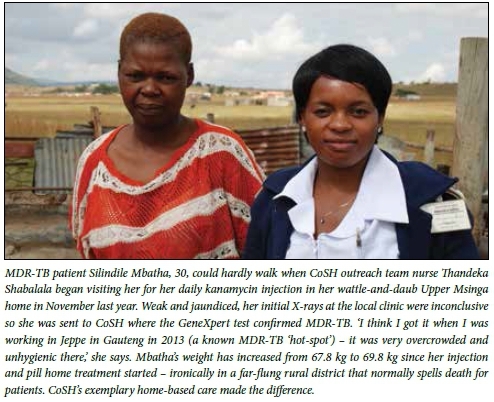 This is almost entirely due to CoSH's outreach injection/home-based care programme being closely emulated in the other three satellite feeder health districts, plus improved drug adherence counselling. TB prevalence in CoSH's Msinga district stands at 1 000/100 000 population (about the national average, the WHO attributing 'emergency status' to any country at 250/100 000 or above). The team has contributed heavily to the national guidelines for community management of MDR-TB and the decentralisation of MDR-TB services. 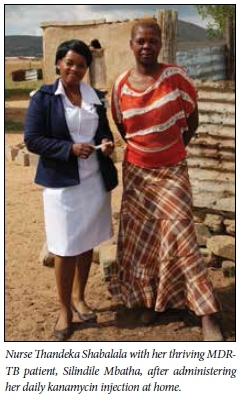 Umzinyathi healthcare workers are saving lives hand over fist (the target being 85%); the overall Umzinyathi district treatment success rate for all regular TB cases was 86.2% in 2011. Last year it was 88.4%. For CoSH in 2011 it was 86.4%. Last year it was 91%. The district's 'suspicion index' (percentage of patients suspected of having TB, irrespective of what services they come for) stands at 4%, the target being 5 - 10%.